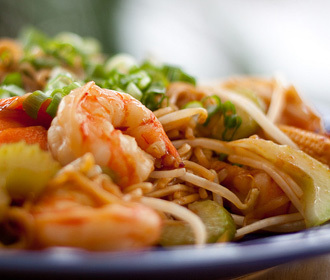 The Best Jumbo Shrimp Chow Mein in Las Vegas is cooked at Kung Fu Thai & Chinese Restaurant. We start by using Premium Egg noodles stir-fried with slices of fresh green cabbage, slices of fresh celery, fresh bean sprouts, fresh Chinese baby bok choy, and slices of fresh carrots, with raw Jumbo Shrimps, cooked in an Extra large stationary wok with smothered in premium sauces at temperatures up to 500°F rounds out this Chinese icon. Due to popular demand, regular patrons like to personalize their own dish of Jumbo Shrimp Chow Mein by adding extra Jumbo Shrimps. As more Jumbo Shrimps is added, the Chef also throws in a little extra egg noodles as well as a little extra vegetables.